I’ve spent the last decade of my life guiding for salmon and trout in Alaska. However, I was fortunate to return to my childhood fishing grounds in Indiana to do some bass and crappie fishing recently. While conditions were poor given all the rain that’s fallen I had good enough bait to overcome the obstacles Mother Nature created. I spent most of my time in Central Indiana and was forced to cope with high water no matter where I went. I flew home to see family and had dreams of targeting big catfish. On the other hand, the water was so high and fast I wasn’t able to focus on the cats. Instead, I moved to target wipers who come up in high, fast water scrounging for baitfish. I also spent a few days casting to bass and crappie in various lakes and ponds. While my location changed daily my bait never did. 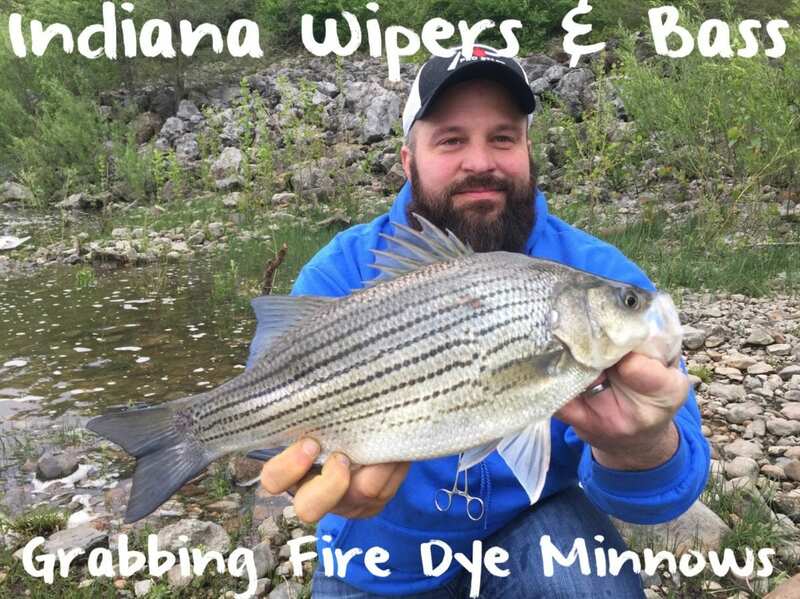 I think I was probably the only person in Indiana that was using live Gold, Chartreuse & Blue Fire Dye minnows – a choice that paid off. In fact, people looked at me kind of funny no matter where I was fishing because I was using slip floats with live dyed minnows as bait. After watching me catching several fish in a row other anglers walked over and asked me what I was using. They had never seen anything to the like of live minnows that were dyed, but believed in the effectiveness as they watched me continue to catch fish. I have many childhood memories of fishing on the Tippecanoe River and that’s the first place I fished. With the waters swelling we fished at Oakdale Dam and on first cast my buddy was amazed when the bobber disappeared. We spent the next two hours fishing Gold & Chartreuse Fire Dye minnows targeting wipers. We kept a dozen and released 40 others while others weren’t having much success. It was a blast. The next day I met other friends and fished many of the stocked ponds in Lafayette. We had success fishing live minnows under bobbers, but weather conditions hurt the bite. We caught a dozen one-pound largemouth on the dyed minnows, but couldn’t get big ones to bite. If we weren’t dodging tornado strength winds and thunderstorms fishing would have been much better. My uncle and I then fished Lake Freeman where we caught a mixture of bass, channel catfish and crappie. This was the first day we caught a break with sunshine. Even know the water level is always stable the water was stained and murky, which provided challenges. Fortunately, the live Chartreuse & Blue Fire Dye minnows kept us in the action. To be honest it had been so long since I fished here that I forgot where the good spots were. Therefore, we simply choose random spots and were still able to be successful sinking minnows under a bobber. The last day we focused on ponds on the north side of Indy. Some were public and others were private. We knocked on the door of the owners and were granted permission. Most of these were largemouth bass and crappie ponds and we used the same exact bait and technique here that we caught fish on everywhere else. It couldn’t have been easier. We used a slip float with Fire Dye minnows on size 1 bait holder hooks and size 4 Aberdeen hooks. Editor’s Note: Dustin Slinker operates The Bait Shack on Ship Creek in Anchorage, Alaska. For more information on his guide trips please visit https://www.thebaitshackak.com. Pautzke Fire Dye is available at most Indiana Walmart stores. 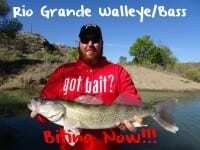 Rio Grande Bass & Walleye Biting Now!